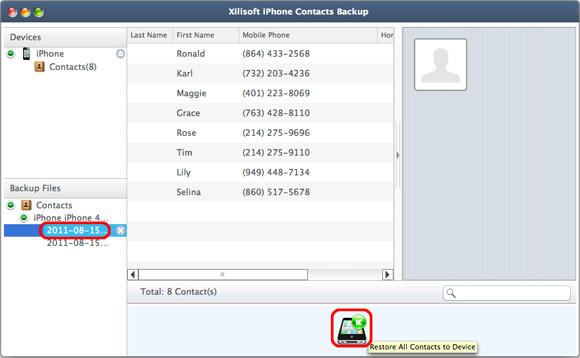 Xilisoft iPhone Contacts Backup for Mac can be your one-stop iPhone contacts management tool which is capable of backup and restoring iPhone contacts information to keep data security, importing and exporting contacts in CSV/vCard format as well as managing your contacts with ease! 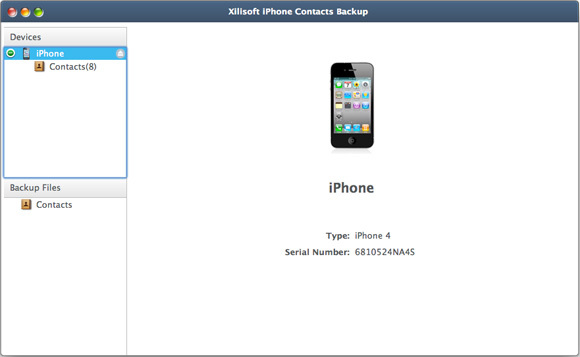 First, download Xilisoft iPhone Contacts Backup for Mac, install and run it. Connect your iPhone/iPad/iPod touch to computer, the application will recognize the device automatically and displays the device information in the interface. 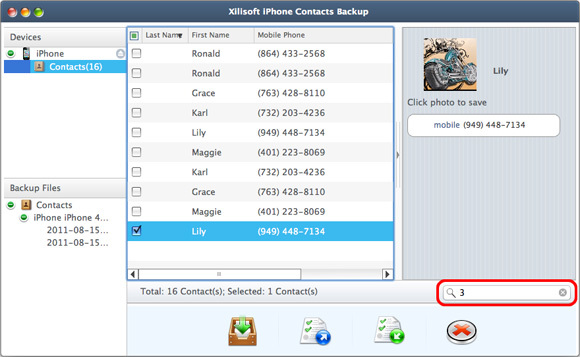 1.In the left directory tree, choose the "Contacts" which you want to backup contacts to local. All contacts will be shown in the right list immediately. 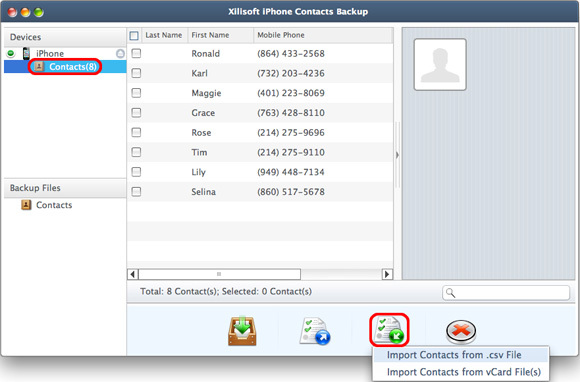 1.In the left directory tree, choose the “Contacts” which you want to export contacts to local. 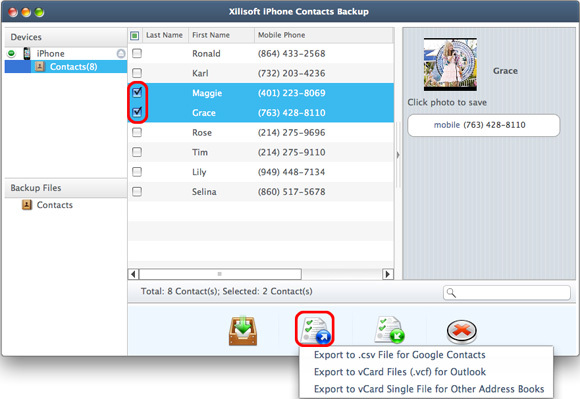 2.Check the wanted contacts in the right list, then click “Export Contacts to Computer” button, choose “Export to .csv File for Google Contacts”, “Export to .vCard Files (.vcf) for Outlook” or “Export to vCard Single File for Other Address Books” option, and locate the target folder in the dialog box that appears, then start exporting. 1. In the left directory tree, choose the target “Contacts” that you want to import contacts into. 2. Click “Import Contacts to Device” button at the bottom of the interface, choose “Import Contacts from .csv File” or “Import Contacts from .vCard File(s)” option, and choose the source contacts file in the dialog box that appears, then start importing. 1. 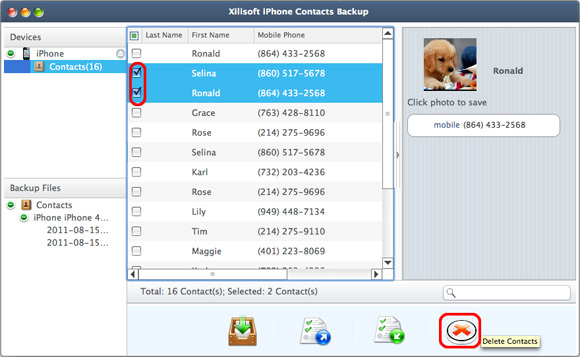 In the left “Backup Files” area, choose the “Contacts” that you want to restore into your device. 2. 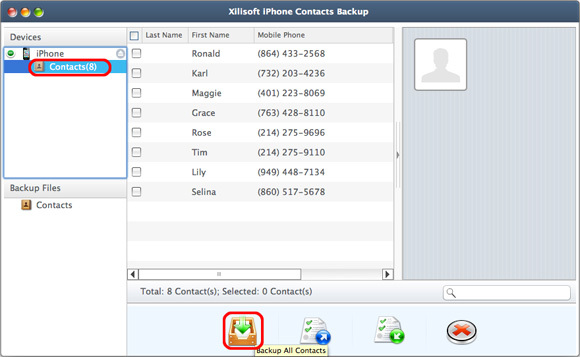 Select a backup file in the left list, then click “Restore all Contacts to Device” button at the bottom of the interface, then start restoring contacts. In the left directory tree, choose the “Contacts” node to unfold the contacts list. Check the contacts in the right list, then click “Delete Contacts” button to delete unwanted contacts. You can search quickly the contacts you want by entering the keyword in the “Search” textbox, then the matched items will be shown in the list immediately.